Happy New Year! And my first About Last Night post for 2016. About Last Night exists because as an entrepreneur, one of my job duties is to leave my cozy apartment and interact with humans at evening events. I'm an introvert. Not shy. I just prefer to hang out with me, myself and my CandyLand-esque thoughts. Some call it crazy. I prefer to call it my Kanye genius. First my outfit. It was a rainy night in San Francisco. I opted for my Lida Baday blazer (she's designed for Oprah), Bebe romper in blue, Refuge jeans and UGG suede boots with heels. 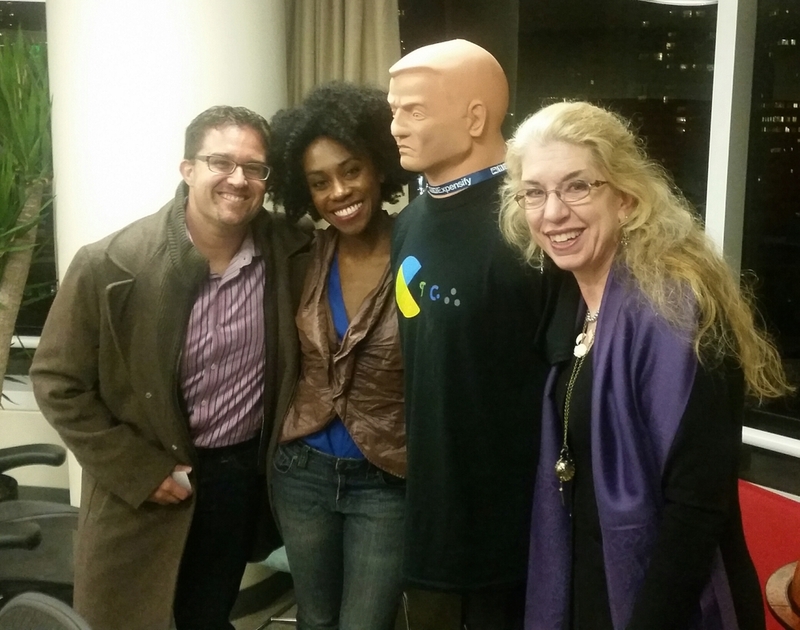 Last night, the event was hosted by the Quickbooks and Business Coaches meetup group. Held at Expensify's office in San Francisco. Ian Vacin from Karbon (formerly known as PracticeIQ) was leading a discussion on emerging trends within the accounting profession. Ian is one of the most respected experts in the accounting world and I love hearing his insights. Taking notes during Ian's presentation. Similar to other industries, the accounting profession is experiencing a drastic shift. Ian shared that the main catalyst for this shift is technology and the continued commoditization of accounting tasks. With companies like Xero (commoditizing bookkeeping functions), TSheets (commoditizing time keeping/tracking) and Libra (eliminating the unnecessary complexity of tax filing), the role of the accountant is being squeezed from every direction. Combining this with the unique needs of the millennial workforce, the industry is shifting from compliance-centric to advisory services. Small accounting practices are now offering virtual CFO services and Top 100 accounting firms are seeing an increase in profitability for their management consulting services. Delving deeper into the generational differences, Ian further explained how millennials are impacting the profession. Millennial accountants are opting out of sitting for the CPA exam and climbing the ladder at a firm. Instead, they are launching their own practices. The cost to start a business is crazy low compared to previous generations. And by running their own business, millennials can experience the freedom they crave to work remotely and engage with clients that inspire them. By definition, the accounting industry is conservative and bases its success on how well it can repeat last year's processes. But, "last year" has turned into twenty-five years. And while accountants within Australia, the UK and New Zealand are swiftly adopting innovative approaches to business. The U.S. market is still lagging behind. When you speak with experts within the accounting world, they claim that the Australian market is a crystal ball into the future of the American market. While this may be true from a technological standpoint, the psychology of the American accountant needs to be addressed. Between the complexity of our banking industry and the rigid beliefs around the role of a bookkeeper and accountant, the American market is not responding quickly enough to the technological changes. If we are still talking about the adoption of the cloud, how can we move on to the more pressing topics? Such as offering advisory services, adopting value-based pricing and recognizing the importance of finding a niche. And never mind the emergence of artificial intelligence and digital currency. The millennial generation is the answer to the U.S. accounting industry's struggle to remain relevant. As a generation, Millennials have an unshakeable desire to create a career that supports their physical and emotional wellness. Moving to the cloud allows for working remotely and traveling the world. Offering advisory services challenge one's creativity versus mindless data crunching. And working with clients that inspire you is fulfilling work that millennials enjoy. But, an industry that is built around 80+ hour weeks, periods of insane workloads, and a sense of fear, does not align with millennials. And instead of putting up with it, Millennials will either jump ship to start their own practices or leave the profession entirely. And we are already seeing the effects of this. According to the AICPA and Journal of Accountancy, while there has been a steady increase of U.S. accounting graduates there is a severe talent shortage. In my post last year about why millennials won't work for accounting practices, I addressed the importance of firms proactively creating a brand and online presence that engages millennials. Recruit non-CPA employees. As your firm develops its advisory services and niche, you will need people with a variety of experiences to facilitate these engagements. An accounting student that double-majors in Communications with internship experience at a creative agency (for example), may be more valuable than a recent graduate who holds a CPA license. Promote based upon accomplishments versus time spent at the firm. Yes, experience is great. But, someone with 20 years experience who is not tech savvy nor interested in keeping up with trends, is not the person you should promote to partner. If a millennial demonstrates their ability to bring business to the firm and service their clients well, he/she should be rewarded with a higher compensation and a promotion. Stop being arrogant. There is an undercurrent of arrogance that the accounting industry is untouchable. It's an air that accountants are the only people that understand taxes or know how to analyze numbers. Well, the publishing industry thought the same thing. Then came self-publishing. And so did the music industry. BAM. Napster. Then iTunes and YouTube. And before Hotwire and Google for that matter, only travel agents could access good deals. As the saying goes, "Knowledge makes people humble. Arrogance keeps people ignorant." Change is coming. In fact, it's here. And in my humble opinion, the U.S. accounting profession is not responding quickly enough. But, then again, you probably shouldn't listen to a word I say. Because, after all, I'm just a chick in my twenties. With no experience and more concerned about getting the best lighting for a selfie. Sipping on a mimosa at noon on a Thursday. While, quietly watching the industry's every move. From my laptop. Danetha Doe (@danethadoe) is a business strategist and was named one of the Top 40 under 40 accounting professionals in 2015 by CPA Practice Advisor. Her client list includes Xero and Libra. Click here to learn more about her next Future of Accounting event. Newer PostMind on my money. Money on my mind. How to do your bookkeeping in 3 steps. Older PostWant the perfect booty and savings account in 2016?